Chris Peterson is one of those amazing people who was born to design and create. His family recognized his talent at an early age and encouraged him to to pursue a career as an artist. Chris' aunt worked at the Disney Studio on Baloo the bear in The Jungle Book, as well as on Ludwig Von Drake and the Sports Goofy shorts. She was one of the first woman layout artists at Disney. When Chris was a young boy she would send him drawings from the different animated films that she was working on. He would study each one, practice drawing the characters and then send them to his aunt. At the age of 15, Chris worked for his aunt doing Assistant Animation and he was instantly hooked. When he was only 16, he moved to California and began working full time at Filmation Studio, first assisting on such projects as The Flash Gordon Feature, He-Man Masters of the Universe, and Fat Albert cartoons, and later as a Character Designer on Bravestarr and The Ghostbusters shows. At the age of 19, Chris began sculpting for Filmation and as a freelance artist. He went on to work as an Assistant Animator, Character Designer and Sculptor on television series and feature films including The Secret of N.I.M,H., Fire and Ice, Fern Gully: The Last Rainforest, Rover Dangerfield and Once Upon a Forest. 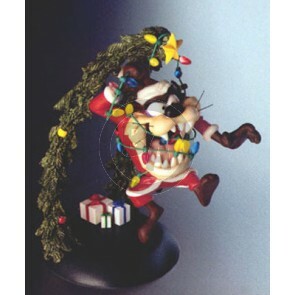 When the animation industry slowed down in 1987, Chris went to work at Applause Inc. as a Product Designer and Sculptor on Disney, Looney Tunes, Sesame Street, Muppets, and many other licensed products. At the end of 1989, he left Applause to form a partnership with his wife Michelle designing, sculpting, and painting on Disney, Looney Tunes, The Disney Store, Disney Consumer Products and several animation, toy and giftware companies. The two of them created such wonderful toys as the as the Lil' Classics PVC figurines, sculpted picture frames, ceramic and porcelain figurines, vinyl banks and PVC figurines for Disney and Warner Bros., as well as promotional items for Kellogg's, Carl's Jr., Sonic's, and Pizza Hut to name a few.